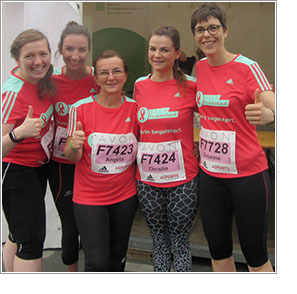 Over 17,000 participants are expected on Saturday for the 35th edition of the AVON Women’s Run Berlin, Germany´s largest women’s run in Berlin´s Tiergarten park. Distances are 5 and 10 km as well as Walking und Nordic Walking events (starting times see website). The last race will start at 6 pm (10 km). All information is available online. You can pick up your race kit between 10 am and 7:30 pm on Thursday and Friday, May 24-25, at Karstadt sports, Joachimsthaler Str. 5-6, 10623 Berlin, as well as on the day of the event after 1 pm at the event venue on the grand boulevard, Strasse des 17. Juni. To pick up your race kit, please bring along a photo ID (govt. issued ID or driver’s license) and your start pass (either a printout or as a digital passbook), which we sent out to you (if you did not receive it, please check your spam folder). With a letter of authorization and the start pass, you can also pick up the race kit for other runners. Please plan on picking up your race materials on Thursday or Friday to avoid long lines on the day of the event. You can register your kids for the Bambini Run at Karstadt sports on May 18-19 or on the 20th at a separate registration booth in the starting area/corner of Yitzhak-Rabin-Strasse (3 Euros). "Bring Your friends" Deal: As a registered participant, you´ll receive 5 Euros for every friend who signs up on race day together with you. The start and finish are on the boulevard Strasse des 17. Juni. 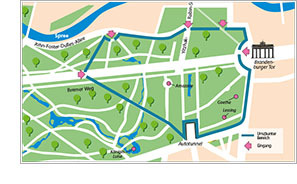 The event venue stretches from the Brandenburg Gate to Grosse Querallee. 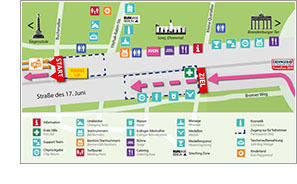 The changing tents, massage and beauty area, storage for valuables and luggage and Kinderland are all located on Yitzhak-Rabin-Strasse (see online map). 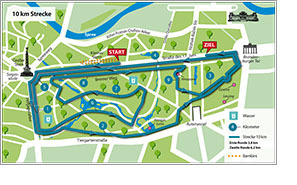 Course maps can be found here. You can find all of the essential information about each discipline online. Parking will not be possible on Strasse des 17. Juni, so please use public transport. Regional Train: Hauptbahnhof (RE1, RE2, RE7, RB14), Potsdamer Platz (RE4, RE5). Each stop is about a 5-15 minute walk to the event venue. Group warm-ups from professional fitness trainers will be offered before each start on stage in the start area. Due to security measures, the start/finish area will be fenced off. Please note that there are only 5 entrances into the starting area! These are for both athletes and spectators. No dogs and bicycles allowed within the fenced area. Please also keep in mind the list of prohibited items. From the north (3): John-Foster-Dulles-Allee/Zeltenplatz (near the Haus der Kulturen der Welt), Scheidemann Straße/ Yitzhak-Rabin-Strasse and Scheidemann Strasse/Simsonweg (across from the Reichstag). There will be lots to do and experience along the women’s festival mile between Yitzhak-Rabin-Strasse and the Brandenburg Gate, with various stands, entertainment, and food! Free wellness and relaxation activities will be offered at the Beauty Lounge and Massage on Yitzhak-Rabin-Strasse. You can also drop off your luggage for secure safekeeping for a 5€ fee at the tent there, and be sure to stop by to pick up your AVON gift bag until 8 pm (coupon attached to your race number is required for pick-up). Childcare and Drawing Contest in the "Kinderland Spielwiese"
We will be providing lots of fun and action for your kids at Kinderland, with childcare and a drawing contest for kids and youth. The “Kinderland Spielwiese“ will be open from noon to 8 pm, and for a 3€ fee you can leave your kids (age 4 to 10) in our care for a limited time. The Bambini Run presented by berlinovo will get underway for kids up to age 10 at 2 pm. This is open to boys and girls! Race numbers can be picked up at the corner of Yitzhak-Rabin-Strasse. After the race, the kids will get medals, certificates and presents in the finish area. A refreshing shower, a new lipstick or your favorite fragrance – it is the small things that pamper us. Every lady who would like to indulge herself with something nice before the big day on May 26 will find the right thing for her in the AVON online shop: heavenly wellness body care, the latest in anti-aging cosmetics, trendy make-up and lots more. And after the race? Test the mark. EPIC LIP lipstic in one of the 17 hottest trend shades like „berry bold“! The intense berry colour suits every women and makes you feel happy – no matter how good or bad your running result is! 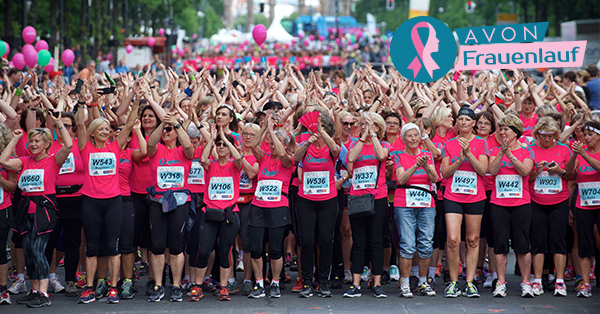 Only a few days left until the Charity Run – a major event with plenty of great offers awaits you. Each runner is capable to grow beyond their borders and own goals. Discover the new SolarBOOST - ultimate power and a highly responsive midsole made to energize your run from the ground up. SOLAR empowers you to build a life-changing routine that gives you the confidence to achieve anything. It supports all runners on their journeys by building confidence through the right product, mindset and culture. Experience it yourself - check it out here. 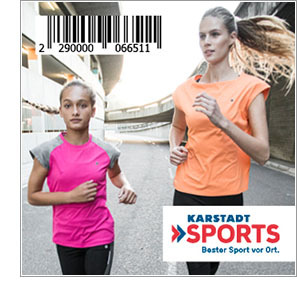 Get yourself a 15% discount at "Karstadt sports am Kranzler Eck"
Get ready and grab your exclusive 15% discount on all sports items at the Karstadt Sports am Kranzler Eck store in Berlin with your running number for the AVON Women’s Race Berlin. Simply bring along a copy of the printed discount flyer with you, or present your phone showing this newsletter at the cash register. The discount will automatically be applied at the cash register. We look forward to your visit and wish you all the best for the race! When they cross the finishing line, every distance queen can look forward to ERDINGER Alkoholfrei in both its classic version and the flavors ERDINGER Alkoholfrei Lemon and Grapefruit. For calorie jugglers: the two variants each have just 25 calories per 100 ml and thus the same low amount as ERDINGER Alkoholfrei. Whether you prefer the classic or the fruity variant: after the race, you’ve more than earned such a fantastic refreshment. Large and clearly visible fruits printed on the serving tents will let you know where to find your favorite. As a cancer patient going through therapy, financial insecurity should not be a concern, but it is for most cancer patients. Luckily, the Berlin Cancer Society is there to help with the hardship fund to ease the financial burden. The hardship fund is funded through donations and fund raising. There is an opportunity to raise money for the hardship fund through charity team. All donations raised by the runners go to women who are in dire need of financial help. Creating a charity team is easy. Raise money together for a great cause! Contact us for more information: www.berliner-krebsgesellschaft.de/spenden/spendenaktionen.